The One Voice Children’s Choir under the direction of Masa Fukuda was invited by the Department of Defense and Historical Programs to sing at the D-Day Commemorations in Normandy, France, in June 2017. While on tour in France this past Summer, they recorded several music videos as a group and members Kenya Clark and Lyza Bull also recorded individual music videos using the beautiful scenery around France as a backdrop. One of the songs that the One Voice Children’s Choir performed while in France was a cover of “When You Believe” from the DreamWorks film The Prince of Egypt. The video was filmed on-location at Omaha Beach (one of the D-Day landing zones) and Brittany American Cemetery and Memorial in Normandy, France. The song was performed in English, Hebrew, and French. According to the video’s description, the song is “dedicated to all the soldiers who fought in World War II, including those who fought at Normandy’s Utah, Omaha, Gold, Juno and Sword Beaches in the D-Day Invasion; and to the millions of Jewish victims who lost their lives during the Nazi Holocaust.” The soloists in the video (in order of appearance) are Abigail Scott, Cairo McGee, Maggie Scott, and Abigail Higbee. The music for this and the other videos were arranged and produced by Masa Fukuda. Nick Sales was the Cinematographer and Editor for all the videos filmed while in France. “Something Just Like This” by The Chainsmokers and Coldplay was another song that they performed. 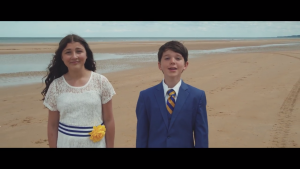 The enchanted video was filmed on location at Mont Saint-Michel in Normandy, France, and Bridger Bay on Antelope Island in Utah, with William Kim and Hazel Knell as the two young actors. The soloists (in order of appearance) are Ryder Mason, Danica Herring. Easton Shane Christiansen, Kalia Reyes, Ellie Thacker, and Hazel Knell. “J’Imagine” also performed by the Choir, is the Vancouver 2010 Olympic theme song. The video was filmed on location in Paris, France, at The Eiffel Tower (La Tour Eiffel), Trocadéro Gardens (Jardins du Trocadéro), Notre Dame Cathedral (Notre-Dame de Paris), The Louvre (Musée du Louvre), and J’ardin d’Acclimation. The soloists (in order of appearance) are Tabitha Hansen, Lydia Oakeson, Kendra Earl, Cosette Stevenson, and Emily Wu. 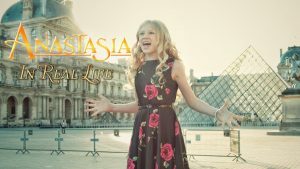 Rounding out the series of video shoots, and inspired by the Anastasia Covers of Peter Hollens, Evynne Hollens, and by Anastasia on Broadway, 12-year-old Lyza Bull, also a member of the One Voice Children’s Choir, takes us on a tour around the city of Paris (Une Visite de la Ville de Paris) as she becomes Anastasia in real life, singing “Journey to the Past” from the movie Anastasia. Lyza says that she loves the message of this song because it talks about the importance of having courage, faith, and cherishing the love of a family. Filming a music video at the Eiffel Tower, The Louvre, and the Notre Dame Cathedral was a surreal experience for both Lyza and the production crew. The adventures that the One Voice Children’s Choir had in France will no doubt be the subject of many stories for years to come. Can I get a copy of the choir music for CHRISTMAS WISH? I want to use the song as a solo in my upcoming recital on December 3rd. I need a piano score. Happy to purchase from you, if available. Thank you for contacting Mormon Music concerning purchasing sheet music for “Christmas Wish.” Mormon Music is a website that promotes the music of LDS music artists. We do not sell or distribute sheet music. My suggestion is to try to contact Masa Fukuda, Director of the One Voice Children’s Choir, through his Facebook page. He may have the sheet music for sale that you are looking for. Thanks! Will the choir ever provide/sell recordings of their music? I would really like to listen to the choir when I drive. Good morning! The One Voice Children’s Choir has several recordings of their music. You can try contacting the Choir or the director, Masa Fukuda, through their social media channels as to how to purchase the recordings. Thanks!